While in the grocery store this past week I found a recipe on the back of a Knorr Sidekicks package that I wanted to share with you. It is not only an easy dish to prepare but also delicious. Look delicious, but where do you get the vegetable spring rolls to serve it with? Do you make those yourself? Hi Aya, I bought them in the frozen food section but I would like to try and make them myself one of these days soon. This really does sound sweet and simple. I'm going to have to find me some of those honey garlic noodles! 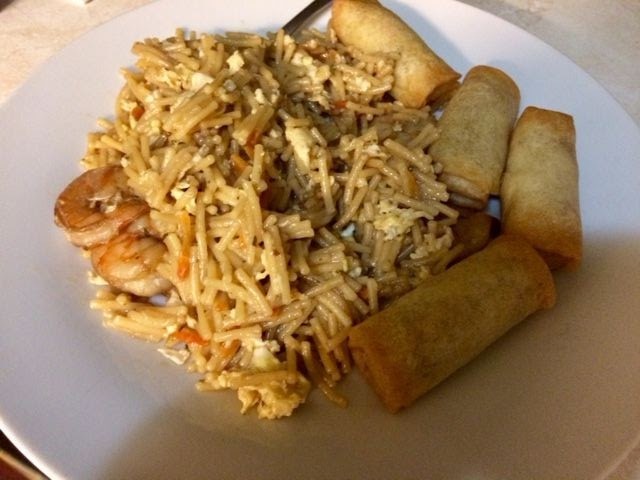 I hope you come up with an easy spring roll recipe soon, too! Thanks Ruth, I hope to be making spring rolls soon. I love shrimp! Thanks for sharing this...it's so different! Rebecca, Thanks and if you ever make this please let me know what you think. I really like this Susan. I like the simple part and it looks so good. Now, send the recipe for those spring rolls!!! I love the recipe. I always use the frozen spring rolls too, because they less labor intensive for me. This recipe to accompany them would be perfect to add to my list of oriental style dishes. Thanks Susan! Yum! Sounds delicious. I want to try this recipe very soon. Thanks!